Photo is from the collection of Bristol Bob and is published with his permission. It shows the Dennis F25 Water tender in front of the Nailsea Fire Station in the early seventies. The station was replaced in the early seventies and this one built in 1937 was eventually demolished. 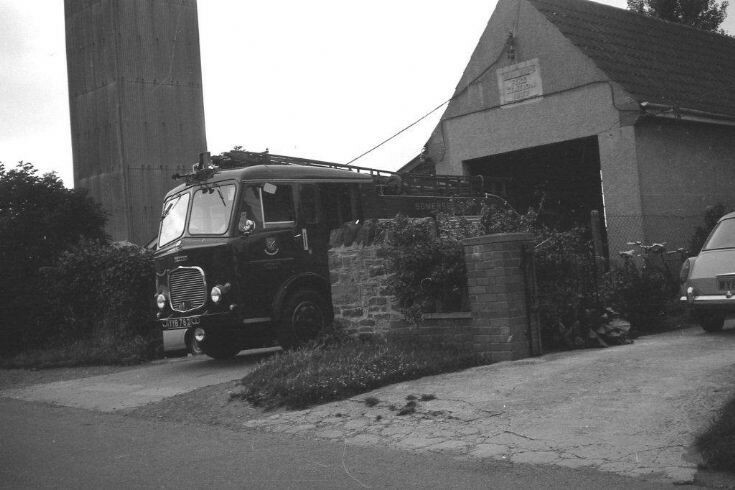 The station and the Dennis F25 passed into the control of the County of Avon Fire brigade in 1974 when it was also upgraded to a two pump station. How was the F25 different from the F24? Was this the one with the Dodge engine instead of the Rolls Royce? Added by Rob Johnson on 30 November 2018. I think you are correct the F25 definitely had the Dodge Kew 4 cylinder engine. Underpowered but the Somerset ones had a five speed box whereas the F28’s a four speed. Most of The F25’s Somerset had didn’t last that long in front line service before being relegated to the reserve fleet due to the lack of performance. I know radstock for example had one originally but complained how slow it was going up the hill towards Bath. A turnout was staged firstly with the F25 and then with the F28 from paulton for the fleet manager to be shown the problem. Needless to say a short time later the F25 was replaced with a F28. Added by Paul Pickford on 08 December 2018.